I hope title is right. (if mods can think of better and more appropriate then please change it) so In this thread, we will give some stats about a player and then you can use what ever you want, statsguru on cricinfo is the most useful, to name the player. I will start with one. I have 41 centuries overall (tests, odis, t20, list A, first class) I have played for ICC world XI I have played for Leicestershire county I have played for Ireland :two_thumbs_up: first correct answer to this gets $50,000 from me. thats only for this question, ICF money involved is optional. Ireland and ICC World XI. Are you sure ? spot on mate. 50 khokhay are yours. number 2 My test batting averrage is better than my ODI My test Bowling averrage is better than my ODI combined i have 22000+ International runs I have played for two countries too. yes phedarus, thats right. this is so easy. isnt it. but things do get tough. 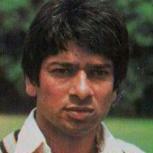 #3 HI am only ODI and test player. I Have Played same Number of ODI and Test Matches I Have same number of 50s I have taken same number of catches in both formats I have not bowled a single ball in international cricket. My Average is below 35 in both formats In my last test innings I have faced 239 balls. Yeah, he played for Scotland. :hmmmm2: I thought that it was well-known. come on lads, number 3, post number 12 is still not answered. come on lads' date=' number 3, post number 12 is still not answered. [/quote'] Give another clue..Asian? Is using any method for getting the answer fair? Mohammed Rafique of Bangladesh. He was born in Dhaka which was part of Pakistan at the time of his birth! The one on the left is def Azhar. The other one is Tendulkar or Jadeja. If I remember correctly WI playing a test against England, when on the last ball of the day batsman played a defensive shot. Kalicharan knew that there was no run, he started walking towards the pavilion and bowler run out him. Umpire gave him out because he didn't call the over yet. This led to the controversy and in next test, main players didn't play. Some details maybe wrong. I read this about 10 years ago. What many regard as his finest innings, 158 against England in Port of Spain in 1973-4, was shrouded in controversy. Having made 142, he watched Bernard Julien play the last ball of the first day to Tony Greig at silly point before walking down the pitch towards the pavilion never having returned to his crease from backing up. Greig threw down the bowlers stumps and Kallicharran was given out by Douglas Sang Hue only to be reinstated next morning after the mood of the tour had been soured. that tony grieg was an instigator when playing as he is now commenting.